I’m always on the hunt for a new mascara, especially a green one. 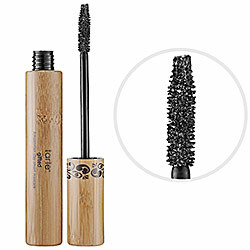 IDK recently all of my mascaras have not been doing there thing aka lengthening and curling– yes I need and want both. I do have a stand by, this one, but even though its amazing with zero flakes and massive length and curl, summer makes me want to go greener with my beauty products even more than I already do. I had a convo with Marisa from Wear Your Vitamins ages about about this mascara and finally stumbled upon a travel size version of this so I gave it a whirl. When I use it with my Shu Uemura Eyelash Curler, it lengthens and curls and leaves the best glossy black finish. In terms of wear, it lasts, but it does flake a bit, maybe its the summer and its humidity but I definitely noticed a subtle shadow under my eyes after four hours. It was not massive by any means, it could easily be remedied with a swipe of a finger but still, it was there and it was noticeable. I love the length and curl, but the flakes I can do without. Sad, another green mascara bites the dust.